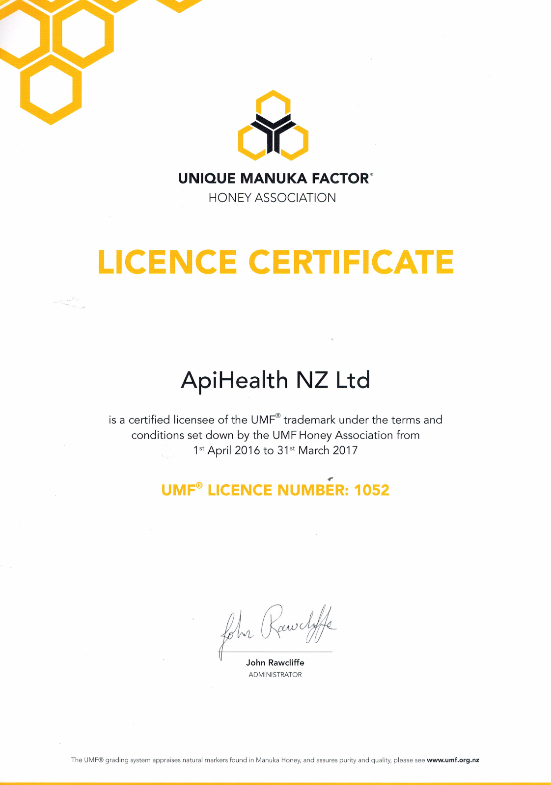 ApiHealth Manuka honey UMF®20+ is produced in New Zealand and contains special properties not found in other honeys. ApiHealth UMF®20+ Manuka Honey is guaranteed to be at least UMF® 20+ and has been verified by an independent testing laboratory. UMF® stands for ‘Unique Manuka Factor’, a measure of the unique type of activity which is naturally present at varying levels in honey made from the nectar of the Manuka bush (Leptospermum scoparium), native to New Zealand. The mark UMF® is followed by a number that indicates the strength of the UMF® activity in a batch of UMF® Manuka Honey. The higher the UMF® rating, the more potent the product. Manuka honey is gathered in New Zealand from Manuka bush, Leptospermum scoparium, which grows uncultivated throughout the country. We are proud to inform you that every batch had been tested in Analytica laboratories and supported by UMF Test Report. We send a copy of report by your request.